dotnet-ef is a handy too to generate Entity Framework migrations and save them to disk. Due to the instability of the .NET Core RC2 feed at the moment, it often doesn’t work. 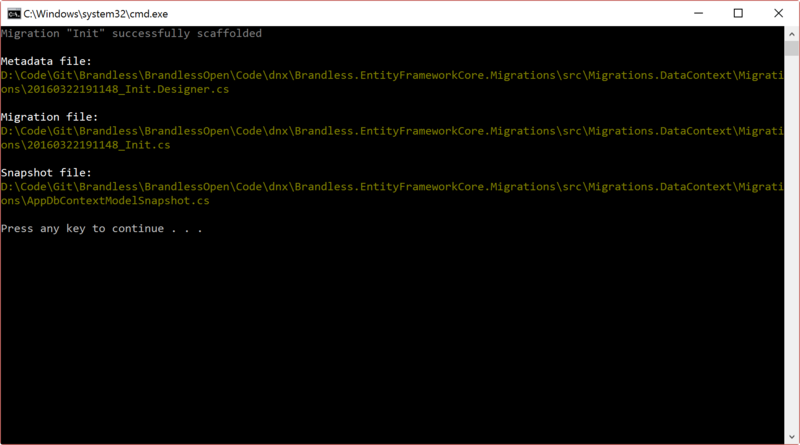 However we can generate migrations manually using the Microsoft.EntityFrameworkCore.Commands package, which is what dotnet-ef relies on. I have put such a package together. Right now it only is able to add a migration. 1 - Create a new console application in the same solution as your data context, and reference the project that contains your data context in your new console app. Feel free to contribute to the open source project with pull requests, adding other tools from the Entity Framework commands as you might need. I am sure I’ll add a few over time.